MY DAUGHTER ASKED ME TO JUMP ON THE TRAMPOLINE WITH HER. I J - ProudMummy.com the Web's Community for Mums. MY DAUGHTER ASKED ME TO JUMP ON THE TRAMPOLINE WITH HER. 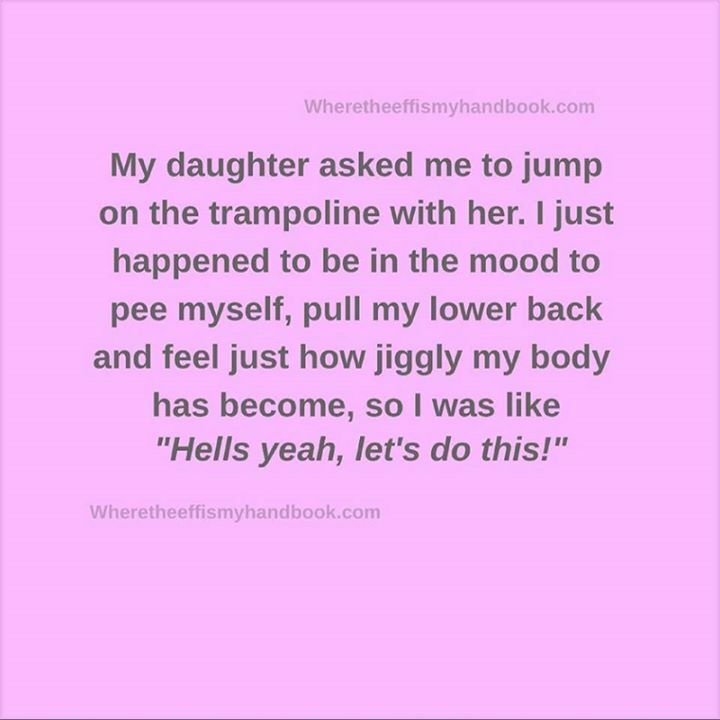 I JUST HAPPENED TO BE IN THE MOOD TO PEE MYSELF, PULL MY LOWER BACK AND FEEL JUST HOW JIGGLY MY BODY HAS BECOME, SO I WAS LIKE "HELLS YEAH, LET'S DO THIS!" Kat Marshall me on Tuesday without the peeing. Going to do the trampoline sessions minus kiddywinks late nights starting next week, lots of fun.